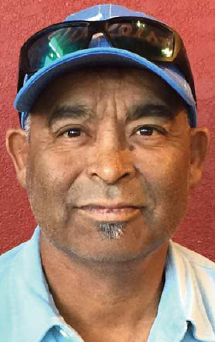 Services are scheduled for 9:30 a.m. Tuesday, Feb. 21, at Our Lady of Grace Catholic Church for Jose Alonzo Briones of Artesia. Briones, 55, passed away Thursday, Feb. 16, 2017, in Texas. Fr. Martin Cornejo will officiate at the services, with interment to follow at Woodbine Cemetery. Visitation will begin at noon Monday at Terpening & Son Mortuary. A rosary will be recited at 6:30 p.m. Monday at Our Lady of Grace. Jose was born Aug. 10, 1961, in Kermit, Texas, to Alonzo V. and Antonina (Lopez) Briones. He came to Artesia in 1998 from Texas. On Aug. 19, 2000, he married Erma Molina in Jal. Jose worked as a diesel mechanic and enjoyed the outdoors. He liked to hunt, fish and golf. His love was spending time with his family. Survivors include his wife, Erma, of the family home; daughters Valerie and Kimberly Briones, both of Mathis, Texas, and Lisa and Bonnie Alvarado, both of Artesia; son Michael Alvarado and wife Liza of Murrieta, Calif.; sisters Maria Baeza and husband Hector of Hobbs, and Jeanette Lopez and husband Arturo of Artesia; brothers Ruben Briones and friend Lori, and Rene Briones and wife Amanda, both of Monahans, Texas; 12 grandchildren; and numerous nieces and nephews.